Airspan’s iBridge is a cutting-edge fixed wireless access backhaul solution that excels in PTMP links in both urban and suburban and PTP for short, medium and long-distance links. iBridge addresses the rapidly growing wireless broadband markets and further establishes Airspan as a leader in the convergence of densified 4G/5G mobile network backhaul and Broadband Access. Airspan’s point-to-point (PTP) solutions offer short, mid and long-haul links, spectrum saving GPS Sync, incredible link resiliency, and rugged designs. Our higher-reliability PTP solution uses the iBridge B24, iBridge B11, iBridge B5, and iBridge B5c to deliver aggregate speeds of up to 1.5 Gbps, with less than 1 ms of latency. Airspan’s unique GPS Sync technology allows collocation and channel reuse. These products are built for reliability, with IP67 ratings and Dual-Link wireless redundancy. In addition, iBridge C5c and iBridge C5x delivers up to 700 Mbps, supporting an extended frequency range. 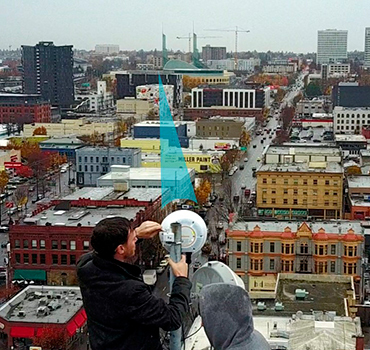 Airspan’s point-to-multipoint (PTMP) solutions enable operators to provide fiber-fast connectivity to residential and business subscribers. Providing the highest bandwidth per client deployments in the extended frequency range from 4.9 up to 6.4 GHz, it integrates GPS sync for spectrum reuse. 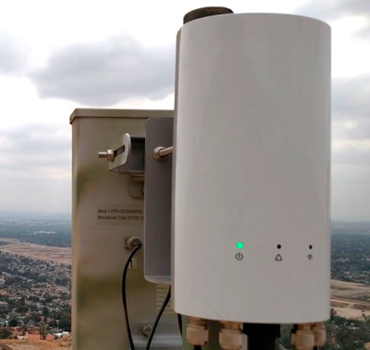 Our long-range architecture supports massive scaling of subscribers and capacity at existing towers, as well as easy build-out of new tower locations closer to potential subscribers—all by smartly reusing scarce wireless spectrum resources. For this architecture, iBridge A5c access points and iBridge C5c client radios will cover the distance. Our short-range architecture is designed for dense urban and suburban neighborhoods. This is achieved using iBridge A5 and iBridge A5c access points, iBridge N5-360 and N5-45 antennas, and iBridge C5c and iBridge C5x client radios. This multipoint solution targets 250-500 Mbps speeds.